Many will recognize the name of Nikola Tesla for his work in electrical engineering. Most do not realize that he was, by training a mechanical engineer. This book is a comprehensive account of Tesla's endeavors and the resulting marvel of machinery which has come to be known as the Tesla Turbine. Tesla's engine is examined in detail and an argument is built for the commercial production of this wonder of engineering. Many fine articles show that no other pump or engine can match the safety, economy, longevity and performance of this truly elegant machine. Suppose some one should discover a new mechanical principle--something as fundamental as James Watt�s discovery of the expansive power of steam�by the use of which it became possible to build a motor that would give ten horse power for every pound of the engine�s weight, a motor so simple that the veriest novice in mechanics could construct it and so elemental that it could not possibly get out of repair. Then suppose that this motor could be run forward or backward at will, that it could be used as either an engine or a pump, that it cost almost nothing to build as compared with any other known form of engine, that it utilized a larger percentage of the available power than any existing machine, and, finally, that it would operate with gas, steam, compressed air or water, any one of them, as its driving power. It does not take a mechanical expert to imagine the limitless possibilities of such an engine. It takes very little effort to conjure up a picture of a new world of industry and transportation made possible by the invention of such a device. �Revolutionary� seems a mild term to apply to it. 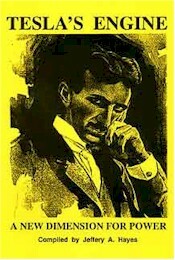 That, however, is the word the inventor uses in describing it�Nikola Tesla, the scientist whose electrical discoveries underlie all modern electrical power development, whose experiments and deductions made the wireless telegraph possible, and who now, in the mechanical field, has achieved a triumph even more far reaching than anything he accomplished in electricity. There is something of the romantic in this discovery of the famous explorer of the hidden realms of knowledge. The pursuit of an ideal is always romantic, and it was in the pursuit of an ideal which he has been seeking twenty years that Dr. Tesla made his great discovery. That ideal is the power to fly�to fly with certainty and absolute safety�not merely to go up in an aeroplane and take chances on weather conditions, �holes in the air,� tornadoes, lightning and the thousand other perils the aviator of today faces, but to fly with the speed and certainty of a cannon ball, with power to overcome any of nature�s aerial forces, to start when one pleases, go whither one pleases and alight where one pleases. That has been the aim of Dr. Tesla�s life for nearly a quarter of a century. He believes that with the discovery of the principle of his new motor he has solved this problem and that incidentally he has laid the foundations for the most startling new achievements in other mechanical lines. There was a time when men of science were skeptical�a time when they ridiculed the announcement of revolutionary discoveries. Those were the days when Nikola Tesla, the young scientist from the Balkans, was laughed at when he urged his theories on the engineering world. Times have changed since then, and the �practical� engineer is not so incredulous about �scientific� discoveries. The change came about when young Tesla showed the way by which the power of Niagara Falls could be utilized. The right to divert a portion of the waters of Niagara had been granted; then arose the question of how best to utilize the tremendous power thus made available�how to transmit it to the points where it could be commercially utilized. An international commission sat in London and listened to theories and practical plans for months. Then came the announcement of young Tesla�s discovery of the principle of the alternating current motor. Practical tests showed that it could be built�that it would work. That discovery, at that opportune time, decided the commission. Electricity was determined upon as the means for the transmission of Niagara�s power to industry and commerce. Today a million horse power is developed on the brink of the great cataract, turning the wheels of Buffalo, Rochester, Syracuse and the intervening cities and villages operating close at hand the great new electro-chemical industries that the existence of this immense source of power has made possible, while all around the world a thousand waterfalls are working in the service of mankind, sending the power of their �white coal� into remote and almost inaccessible corners of the globe, all because of Nikola Tesla�s first great epoch making discovery. �It is the greatest invention in a century,� wrote one of the foremost American engineers, a man whose name stands close to the top of the list of those who have achieved scientific fame and greatness. �No invention of such importance in the automobile trade has yet been made,� declared the editor of one of the leading engineering publications. Experts in other engineering lines pointed out other applications of the new principle and letters asking for further information poured in on Dr. Tesla from the four quarters of the globe. �Oh, I've had too much publicity,� he said, when I telephoned to him to ask for an interview in order to explain his new discovery to the non-technical public. It took a good deal of persuasion before he reluctantly fixed an hour when he would see me, and a good bit more after that before he talked at all freely. When he did speak, however, he opened up vistas of possible applications of the new engine that staggered the imagination of the interviewer. Looking out over the city from the windows of his office, on the twentieth floor of the Metropolitan Tower, his face lit up as he told of his life dream and its approaching realization, and the listener�s fancy could almost see the air full of strange flying craft, while huge steamships propelled at unheard of speeds ploughed the waters of the North River, automobiles climbed the very face of the Palisades, locomotives of incredible power whisked wheeled palaces many miles a minute and all the discomforts of summer heat vanished as marvelous refrigerating plants reduced the temperature of the whole city to a comfortable maximum�for these were only a few of the suggestions of the limitless possibilities of the latest Tesla discovery. �Just what is your new invention?� I asked. �I have accomplished what mechanical engineers have been dreaming about ever since the invention of steam power,� replied Dr. Tesla. �That is the perfect rotary engine. It happens that I have also produced an engine which will give at least twenty-five times as much power to a pound of weight as the lightest weight engine of any kind that has yet been produced. �In doing this I have made use of two properties which have always been known to be possessed by all fluids, but which have not heretofore been utilized. These properties are adhesion and viscosity. �Put a drop of water on a metal plate. The drop will roll off, but a certain amount of the water will remain on the plate until it evaporates or is removed by some absorptive means. The metal does not absorb any of the water, but the water adheres to it. �The drop of water may change its shape, but until its particles are separated by some external power it remains intact. This tendency of all fluids to resist molecular separation is viscosity. It is especially noticeable in the heavier oils. �It is these properties of adhesion and viscosity that cause the �skin friction� that impedes a ship in its progress through the water or an aeroplane in going through the air. All fluids have these qualities�and you must keep in mind that air is a fluid, all gases are fluids, steam is fluid. Every known means of transmitting or developing mechanical power is through a fluid medium. �There we have a disk, or rather a series of disks, revolving in a fluid�the air,� said the inventor. �You need no proof to tell you that the air is being agitated and propelled violently. If you will hold your hand over the centre of these disks�you see the centres have been cut away�you will feel the suction as air is drawn in to be expelled from the peripheries of the disks. �Now, suppose these revolving disks were enclosed in an air tight case, so constructed that the air could enter only at one point and be expelled only at another�what would we have?" �You'd have an air pump,� I suggested. �Exactly--an air pump or blower,� said Dr. Tesla. �Suppose now we reversed the operation,� continued the inventor. �You have seen the disks acting as a pump. Suppose we had water, or air under pressure, or steam under pressure, or gas under pressure, and let it run into the case in which the disks are contained�what would happen?" �The disks would revolve and any machinery attached to the shaft would be operated�you would convert the pump into an engine,� I suggested. �You have got what Professor Langley was trying to evolve for his flying machine�an engine that will give a horse power for a pound of weight,� I suggested. �That means the solution of the problem of flying,� I suggested. �Then, too,� Dr. Tesla went on, �there are no delicate adjustments to be made. The distance between the disks is not a matter of microscopic accuracy and there is no necessity for minute clearances between the disks and the case. All one needs is some disks mounted on a shaft, spaced a little distance apart and cased so that a fluid can enter at one point and go out at another. If the fluid enters at the centre and goes out at the periphery it is a pump. If it enters at the periphery and goes out at the center it is a motor. �Coupling these engines in series, one can do away with gearing in machinery. Factories can be equipped without shafting. The motor is especially adapted to automobiles, for it will run on gas explosions as well as on steam. The gas or steam can be let into a dozen ports all around the rim of the case if desired. It is possible to run it as a gas engine with a continuous flow of gas, gasoline and air being mixed and the continuous combustion causing expansion and pressure to operate the motor. The expansive power of steam, as well as its propulsive power, can be utilized as in a turbine or a reciprocating engine. By permitting the propelling fluid to move along the lines of least resistance a considerably larger proportion of the available power is utilized. �As an air compressor it is highly efficient. There is a large engine of this type now in practical operation as an air compressor and giving remarkable service. Refrigeration on a scale hitherto never attempted will be practical, through the use of this engine in compressing air, and the manufacture of liquid air commercially is now entirely feasible. �And it makes the aeroplane practical,� I suggested. �Not the aeroplane, the flying machine,� responded Dr. Tesla. �Now you have struck the point in which I am most deeply interested�the object toward which I have been devoting my energies for more than twenty years�the dream of my life. It was in seeking the means of making the perfect flying machine that I developed this engine. �Twenty years ago I believed that I would be the first man to fly; that I was on the track of accomplishing what no one else was anywhere near reaching. I was working entirely in electricity then and did not realize that the gasoline engine was approaching a perfection that was going to make the aeroplane feasible. There is nothing new about the aeroplane but its engine, you know. �What I was working on twenty years ago was the wireless transmission of electric power. My idea was a flying machine propelled by an electric motor, with power supplied from stations on the earth. I have not accomplished this as yet, but am confident that I will in time. �An aeroplane driven by your engine?� I asked. �Not at all,� said Dr. Tesla. �The aeroplane is fatally defective. It is merely a toy�a sporting play-thing. It can never become commercially practical. It has fatal defects. One is the fact that when it encounters a downward current of air it is helpless. The �hole in the air� of which aviators speak is simply a downward current, and unless the aeroplane is high enough above the earth to move laterally but can do nothing but fall. �There is no way of detecting these downward currents, no way of avoiding them, and therefore the aeroplane must always be subject to chance and its operator to the risk of fatal accident. Sportsmen will always take these chances, but as a business proposition the risk is too great. �The flying machine of the future�my flying machine�will be heavier than air, but it will not be an aeroplane. It will have no wings. It will be substantial, solid, stable. You cannot have a stable airplane. The gyroscope can never be successfully applied to the airplane, for it would give a stability that would result in the machine being torn to pieces by the wind, just as the unprotected aeroplane on the ground is torn to pieces by a high wind. �You will get stability through gyroscopes?� I asked. �Through gyroscopic action of my engine, assisted by some devices I am not yet prepared to talk about,� he replied. �Powerful air currents that may be deflected at will, if produced by engines and compressors sufficiently light and powerful, might lift a heavy body off the ground and propel it through the air,� I ventured, wondering if I had grasped the inventor�s secret.